Who's Coming to Reunion I/Commencement? Who's Coming to Reunion II? Watch for news from your class Reunion team about the exciting programming they have planned. Reconnect with classmates you haven’t seen in five, 10, 20 years—or make a new connection with a classmate you never knew during your time on campus. You’ll leave with an expanded circle of friends and a richer connection to Smith! 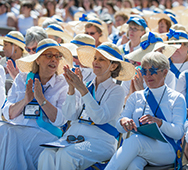 Visit your class website for more information about class programming, or contact your Reunion Chair. *Seniors and many undergraduates are still in residence in most houses through Reunion I weekend, and the number of rooms available will dictate how many houses are assigned for each class, as well as their proximity to each other. 1964 Journeys 1964 What’s Next?